Artistic Director and Co-Founder of the Valley of the Moon Music Festival, cellist Tanya Tomkins is equally at home on Baroque and modern instruments. She has performed on many chamber music series to critical acclaim, including the Frick Collection, “Great Performances” at Lincoln Center, the 92nd Street Y, San Francisco Performances, and the Concertgebouw Kleine Zaal. She is renowned in particular for her interpretation of the Bach Cello Suites, having recorded them for the Avie label and performed them many times at venues such as New York’s Le Poisson Rouge, Seattle Early Music Guild, Vancouver Early Music Society, and The Library of Congress. Violist, Joanna is an avid chamber music player both in modern and period styles, and has a passion for the music of our time. She is a member of the Lafayette String Quartet, formed in 1986 and based in Victoria BC. She is a founding member of the Historically informed performance groups, The Loma Mar Quartet, founded in 1997 and the DNA Quintet formed in 2008, both based in New York. With these two group’s she recorded two CD’s of the newly discovered chamber works of Domenico Dragonetti. The first recording won the prestigious Classical Recording Foundation Award for 2009. 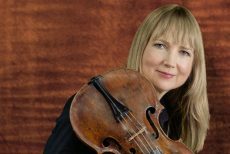 She is the principal violist with the Seattle Baroque Orchestra, and performs with the Pacific Baroque Orchestra and the Victoria Baroque Players, and has performed with Pacific Music Works, Oregon Bach Festival, and The Serenade Orchestra. She is a founding member of the Victoria new music group, Ensemble Tsilumos, and is a co-organizer of the SALT New Music Festival and Symposium in Victoria BC. Hood studied at the San Francisco Conservatory with Isadore Tinkleman, and at Indiana University, where she was an Associate Instructor, with Abraham Skernick and baroque violinist Stanley Ritchie. Joanna is an Artist-in-Residence with the Lafayette Quartet at the University of Victoria where she teaches viola and chamber music. She plays on a viola labeled Johan Samuel Fritsche, dated Leipzig, 1805, and a viola by Edmond Aireton, 1754. Joanna has recorded for the EMI, Tzadik, Dorian, CBC, Adlar, and Vervue labels.